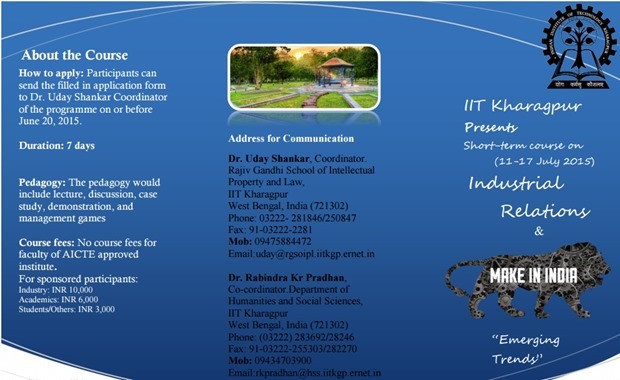 IIT Kharagpur has become country’s first institution to provide a course on ‘Make in India’ vision initiated by PM Modi and supported by the Indian Govt. This 7-days short term course termed as ‘Industrial relations and Make in India: emerging trends’ will teach students about the main agenda behind this vision, and how a harmony can be restored between ‘industrial democracy’ and people via land and people friendly initiatives. 1 What Will Be Taught? At a time when the Indian Govt. is leaving no stone unturned to create more awareness and favorable conditions for industry leaders and SMEs to start manufacturing in India, this course has been designed to make people understand the core logic behind this vision, and to educate them about the contemporary industrial laws and regulations. The whole course has been divided into 6 modules, which would be taught within 7 days. Academicians, industry partners and students can attend this course which will happen between July 11 to July 17th at IIT Kharagpur campus. Students only need to pay Rs 3000 for this course, meanwhile Rs 6000 has been finalized for Academics and Rs 10,000 for entrepreneurs and representatives from the industry. The course will have lecture, discussions, case studies, demonstrations and management games to impart maximum knowledge and information about Make in India. In order to participate, students can fill this form, and send the same to Uday Shankar, program co-ordinator before June 20, 2015. In the past few months, we have observed that the motive of Make in India vision cannot be accomplished unless the issue of land acquisition is solved. In some parts of the country, land owners are not happy with the compensation structure, and in some cases, there have been violent agitations as well. In order to provide industry and academicians a better perspective of these issues, IIT Kharagpur is also conducting a special ‘land acquisition, rehabilitation and environmental clearance of projects’ program, which will be conducted between September 15 & September 19, 2015. In September last year, PM Modi launched the ambitious ‘Make in India’ vision to promote investments into India, and to encourage manufacturing inside the country. During one of the speeches, he had curiously asked why despite being a leader in software and services, India is required to import almost 90% of electronics products and high end engineering equipment. Via Make in India vision, he attempted to create a positive image of India and wished to present our country as a manufacturing-friendly nation. Even during his recent trip to China, he emphasized on Make in India vision, and even convinced Chinese industrial leaders to start manufacturing in India. Some of the biggies of electronics and automobile industry have already announced their launch of manufacturing units in India, which includes: Samsung, Sony, Microsoft, Motorola, Ford. Japan has announced that under ‘Make in India’ vision, they will establish 11 industrial townships, and increase their investment by $18 billion in the next 5 years. Indian Govt. have also eased labor laws, and creating an alternative platform for SMEs to raise money from venture capitalists, which will have easier rules. Having said that, much awareness and information needs to be spread out among small scale Indian SMEs and manufacturing powerhouses to make this campaign a roaring success. IIT Kharagpur’ initiative in this direction can certainly help to some extent. However, being a location-specific course, very few entrepreneurs will be able to actually attend this course. We hope that they come out with an online version of the same course in near future to attract more attendance and more participation. Education Industry needs Drastic Internal Changes before going Outbound!